The game winner past Corey Crawford ties the series at one game apiece. 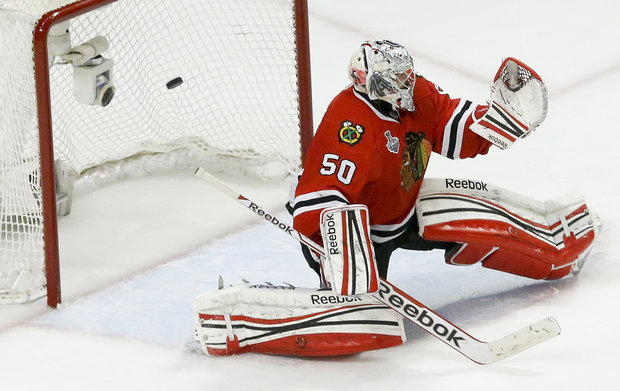 Corey Crawford cannot make the save in OT now it is game 3 tonight. It&apos;s back to work for the Blackhawks tonight with the series in Boston tied at one game apiece. There&apos;s a feeling that the Bruins may have not only stolen the home ice advantage but also taken the momentum. It was a bitter pill for the Hawks to swallow losing Game 2 in overtime at home. The Bruins clearly played better in the extra period. So now the next two games will be Boston Monday and Wednesday night. The Blackhawks know the crowd will be as loud as the one the Bruins faced at the United Center. Chicago&apos;s Duncan Keith says it won&apos;t faze the team. One matter the Hawks have to cure: scoring when they have the opportunity. The Hawks peppered Boston goalie Tuukka Rask in the opening period and then it was a stone wall after that. “It’s not like you’re going to have momentum or dominate a full three periods,” Hawks winger Patrick Kane said. The Bruins have clogged up the center of the ice and stopped the flow of the Blackhawks transition game. Coach Joel Quenneville tried to put a finger on what Boston is doing to his team. “The neutral zone, the way they check, defend, they’re very patient in that area,” he said. Watch the Blackhawks on the power play. This has been a problem all season long, so there is no surprise that they are still unable to notch a goal with their opportunity. At least they still have a solid penalty kill, anchored by Michael Frolik and Marcus Kruger. Their chemistry during the kill has been extraordinary. The only time the Bruins have scored on the power play Frolik was in the penalty box. The NHL announced all the individual player awards and only one Hawk received an honor: Jonathan Toews. He won the Selke trophy for top defensive forward. Brandon Saad came in third for the Calder award for the top rookie. Of course, the only trophy Toews and his teammates want to win is the Stanley Cup. They need to win one of the two games in Boston to get back the home ice advantage. In the post-season Game 3 has been difficult for the Hawks: they are 0-3. Maybe they can break that trend tonight.